To make the pastries you'll need you'll need 12 aluminum molds to make cream horn, 1 round cookie cutter (3 1/2 inches), a large baking dish, and parchment paper. 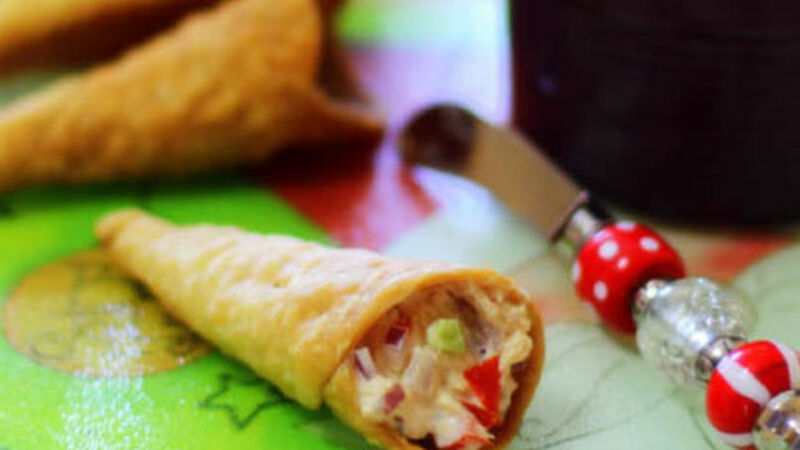 Strain the liquid from the tuna completely; mix with the onion, tomato, peppers, and mayonnaise. Refrigerate until ready to serve. Cut 18 strips of the pastry dough, 1/2 inch thick. Roll each strip into each mold. Start with the thickest end of the mold, be sure to seal the tip well so they don't open up and spill out, cut the excess off. Bake 12 to 15 minutes or until they're golden brown. Should be 2 batches of 12. Remove from the oven, let cool for a few minutes. Separate from the molds, carefully so you don’t burn yourself or break them. Place them on rack and let cool completely before filling. You can use puff pastry to make the cones. Pastry cones are one of the most versatile dishes you can serve because you can stuff with sweet or salty ingredients for the end of the year parties. All you have to do is decide on a filling. These can be a variety of ingredients: tuna, king crab, shrimp, or salmon or you can fill them with chicken or shrimp antipasto, pico de gallo or avocado cheese dip. This time I used tuna!